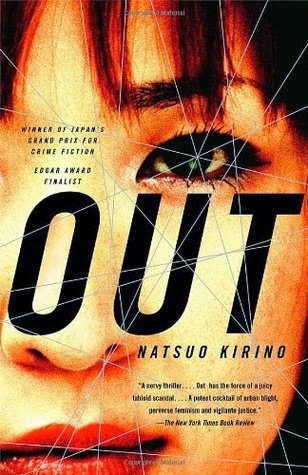 Natsuo Kirino's novel tells a story of random violence in the staid Tokyo suburbs, as a young mother who works a night shift making boxed lunches brutally strangles her deadbeat husband and then seeks the help of her co-workers to dispose of the body and cover up her crime. The ringleader of this cover-up, Masako Katori, emerges as the emotional heart of Out and as one of the shrewdest, most clear-eyed creations in recent fiction. Masako's own search for a way out of the straitjacket of a dead-end life leads her, too, to take drastic action. Visceral is a word that really does describe this book. There were parts I had to close my eyes because the visuals that the words created were too vivid. There's no real mystery as to who did it. The mystery lay in the reasons that three women would take on a gruesome task to help cover the murder committed by a fourth when all they really had in common was a job that was degrading and difficult in itself. This is very much an in depth character study. Why did I find myself rooting for these women even though their actions were horrific and not one of them was truly likable? It might be that each woman has taken her share of neglect and abuse and the measure of freedom each obtained, if only briefly, through said actions. We also get to see a Japan that few fans of it want to see. How there is little equality and that most people eke out a living on a knife edge that any small thing can tip them off that edge and lead to ruin. Also how a consumer driven society has led to debts that are literally collected by thugs. I did find the ending a bit cryptic and that kept me from giving this book a solid five stars but it was so close. Kirino is a powerful writer and one I will definitely read more by.